Amer Fort also called the Amber Fort. 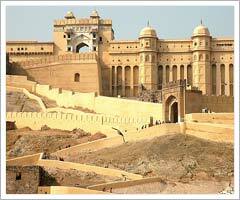 Amer Fort is located on Delhi. Jaipur Highway, 11km from Jaipur.It was built by Raja Man Singh I in the year 1592. Exquisite paintings of hunting scenes on the walls depicit the disposition of the Rajput who were adventurous, revolutionary and self indulgent. The walls and the ceiling of the Mahal are covered with a beautiful assortment of mirrors, which reflect any streak of light, so as to illuminate the entire room. The Amber Fort was once the Capital of the Minas. The crystal mirror image of the Fort, on the still waters of the lake, seems to be a beautiful illusion. The exterior of the Fort is not in the least like its interiors. The outside is very daunting and craggy looking whereas the inside is a comforting and warm interior which is influenced by both Hindu and Muslim style of embellishment. On the walls, are paintings depicting various hunting scenes, and there is also a lot of work on walls, which are covered with intricate carving, mosaic and minute mirror work that make the halls, look very majestic and imperial. The fort is built with white marble and red sandstone and looks even more attractive because of the Maota Lake in the foreground. The fort in itself is a beautiful sight to behold but as one looks on the fort with its clear reflection on the lake in the front; one cannot help but wonder if it is a dream or a stunning delusion.